AL-SL09 is a high-quality 9 LED wireless emergency outdoor Solar Powered Wall Light with PIR Motion Sensor and automatic light sensor. Energy-efficient Solar Panel in combination with pre-installed rechargeable Lithium Battery (Li-Ion) provides up to 12 hours of light performance. 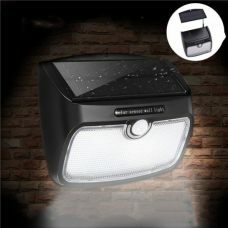 The emergency wall light is durable, weatherproof and designed for outdoor use. Smart motion sensor with extensive range makes the light ideal as an emergency or security lamp. 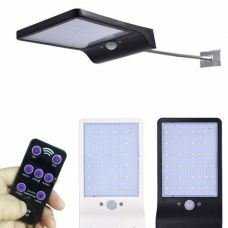 Solar bright wireless 9 LED emergency and security wall light with PIR Motion Sensor ARILUX® model AL-SL08 is a fully Solar Powered product that does not require any additional electric wires or other sources of energy that designed for outdoor use. It has built-in Smart PIR Motion Sensor with extensive sensor range that turns the light up when detecting a movement or presence of people within about 8-10 meters. In addition, the PIR sensor integrated with an automatic light sensor that activates Solar Wall Light at night and put it into the charging mode during the day. The ARILUX AL-SL08 solar light is a completely self-powering and recharging unit so it does not need any wiring or spare batteries. The product has pre-installed energy-efficient Solar Panel that absorbs the sunlight during the day and converts it into the energy which stores at rechargeable energy efficient Li-Ion battery to power the light up at night. The product designed with motion sensors to supply the smart light with the best possible battery life. 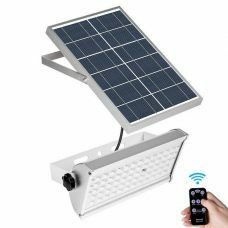 The wireless Solar 9 LED emergency & security wall light AL-SL08 in white body is easy to install by fixing into the wall or fence and operates. It is low-maintenance and cost-efficient Solar Product that provides outstanding performance without additional care. Give your garden and outdoor area a touch of AL-SL08 ARILUX solar wall light and enjoy smart motion detected lighting. Ideal for: lighting up specific areas that require illumination on a full-time basis or only when people presence like garden, backyard, pathway, garage, outdoor stair, step, porch, etc. Suitable for the areas that cannot be light up with wires lights. The model is perfect as emergency and security outdoor light. For whom: a practical person who is looking for a lighting solution for the backyard, garden, garage, etc. without additional costs, and also who feels responsibility for the future and appreciates Solar Power Clean Energy and Green Technology. - Energy saving solar technology. - 9 efficient bright LED lights. 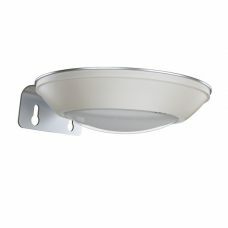 - The elegant design comes with the white colour body of the light. - 3 intelligent operating modes including the sensor, dim and high modes. - Smart motion activated operation with PIR motion sensor and light sensor. - Extensive motion sensor range up to 8-10m. - Enhanced water and weather resistance IP65. - Fully automated operation process.A special light-control system provides LEDs light only in darkness. - Easy to install, setup and operate. User-friendly design, no wiring or any installation needed. Automatically turns light off during the day and will only turn it on when it senses movement at night. The light will turn off after 15 seconds of no movement, if people stay active in the sensor area the bright light mode will remain on. Automatically turns lights off during the day and lights up at night in dim mode. The light will brighten to full brightness mode during the night when movement detected. The light will return to dim mode after 15 seconds of no movement if people stay active in the sensor area the bright light mode will remain on. Automatically turns lights off during the day and lights up at night in full brightness mode. The lighting runs for 4-6 hours after fully charging for 7-8 hours of direct sun. 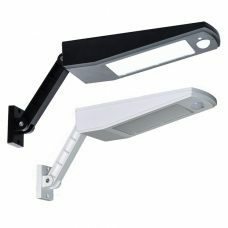 1 x AL-SL08 Solar 9 LED PIR Motion Sensor wall Light. - Solar Product requires direct sunlight, so make sure you place the Solar Panel at an open area where it can absorb the most light during the day. - Keep the Solar Panel clean and free of dirt that can shade the sunlight. - Clean the surface of the Solar Panel with a soft, slightly moistened cloth or a dry brush only. Do not use any corrosive cleaning liquids or chemicals since this may damage the housing surface or impair future operation. - After some period of time when the performance will get weaker, we recommend changing the rechargeable battery (usually after 1 year). This product is brilliant and it lights up the whole doorway when coming in or out. Easy to install. The light is reasonably bright in "high power" mode. Good quality product overall. Have got 4 of these lights week ago and since then they work the whole night, also under winter condition they are lighting from 4:30pm till 6:00am until they shut down automatically when sun is rising up. Good quality! Just enough light for me. Only one thing: make sure it gets almost a full day of sun and it will shine all night. I put it on the top of my carport.